Mix all the above ingredients, I used a car shaped pan from Wilton and I cut the back so that it can become a truck, for the tires I used 4 chocolate doughnuts and used little silver balls for the axles of the tires. I covered the truck with blue buttercream frosting and yellow and orange frosting to do the details of the truck. The license plate number was the date of birth of the birthday boy and wrote his name of the back of the truck with a Happy Birthday sign. For the front lights I used two small marshmallow and 2 red gum drops for the back lights or any red candy that you might have will be the same. I put the truck on top of a plain chocolate cake to give it some height. For this monster truck cake I also used a wafer cookie for the front grill and I covered with chocolate, just thought u might wanted to know another tip! Good Luck! Join in and write your own page! It's easy to do. How? 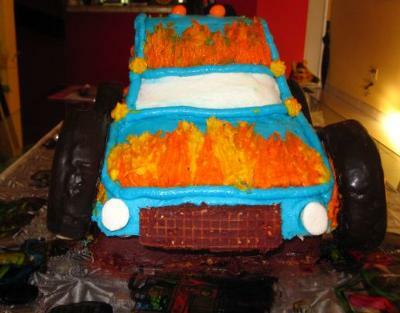 Simply click here to return to Monster Truck Cakes.